ConceptDraw MINDMAP and included plugin Note Exchange solution are the extension for using mindmap in the Evernote. It makes it easy to share your notes with coworkers, associates, classmates, and friends. You can put any part of a mind map including topics, branches, and entire maps to Evernote. Pic 1. 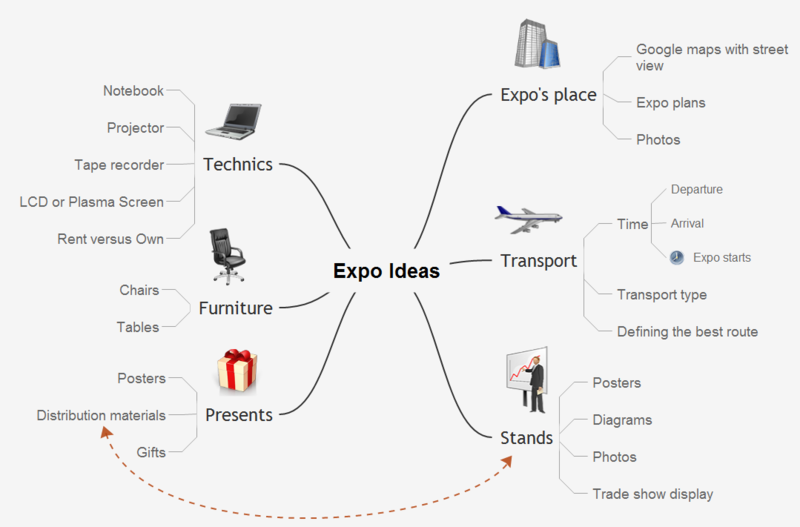 Mindmap - Expo ideas. Note Exchange solution extends ConceptDraw MINDMAP software with the ability to exchange with Evernote, and access mind maps anywhere, on any computer or mobile device via Evernote. You can upload to Evernote a single topic, selected topics, branch or branches (topics with subtopics), a whole single page mind map, or the entire multi-page documents. To launch Projects Exchanging Mind Maps with Evernote using ConceptDraw MINDMAP v10 simply and easily. Critical information from your mindmaps can be accessed from almost any device using ConceptDraw MINDMAP v10 and Evernote. ConceptDraw MINDMAP v10 with the new Note Exchange solution allows users to use mindmap notes from anywhere using powerful Evernote technology. The power, economy, and versatility of ConceptDraw MINDMAP v10 takes personnel and team productivity to another level. Discover today what this means to you. Using Evernote with a Mind Map.